after one bite, i was smitten. this donut rules supreme. 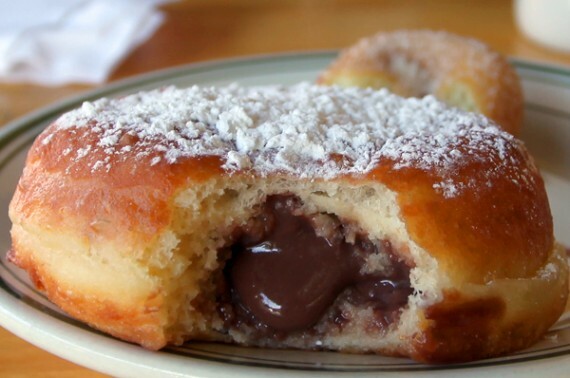 the softest, moistest cake ever—filled up with rich gooey chocolate sauce, all topped with a generous amount of powdered sugar. vegan has seriously never tasted so good. 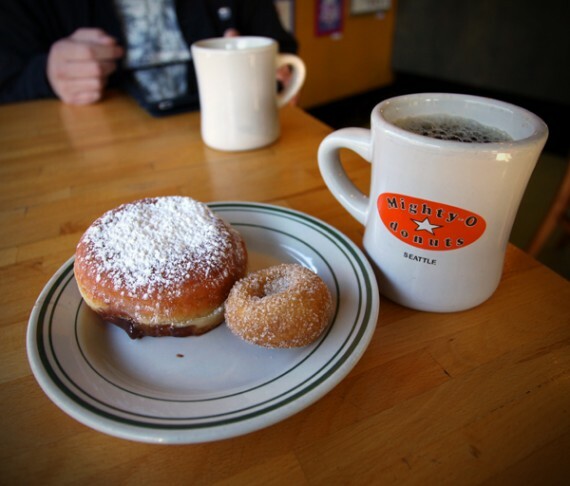 mighty-o donuts is a MUST VISIT for EVERYONE, on EVERY trip EVER to seattle. the old school style, animal-free donut shop is one of the most magical places i’ve ever been. the mighty-o menu is huge, and everything on it sounds appetizing as can be. if i lived in seattle, i would make it a personal mission to work my way through each item. when i was standing in line to order, the dude in front of me said he’d traveled an hour and a half from where he was staying just to eat there. he couldn’t believe there was an all vegan donut shop, and he kept confirming with the cashier that they didn’t use eggs or butter. i watched him eat 8 or 9 donuts all by himself, and i don’t think i’ve ever seen anyone so happy. VeganTreats Boston Creme donuts FTW. Just sayin. oh gaaawwwwdd nom. BUT if you want raised donuts, be sure to get there before early afternoon! they sell out a lot, and they told me they throw any leftovers out around 1 (they claim they aren’t of selling-quality anymore). we need this in LA. now. old-school except for the PRICES!! what i wouldn’t give for a vegan sweet shop to charge non-yuppie prices. you know, like a real donut shop. @ange: i come from LA where cupcakes are over 3 bucks each! $1.95 for that epic donut is a STEAL! Oh that looks so good!! I am dying of nevy!! Can’t wait till we we have proper vegan donuts available in Los Angeles. Can I tell you of the copious amount of excitement I am filled with when I read a post title such as: Best vegan doughnut ever!!!!! I scroll quickly through looking for the gem “Los Angeles”… annnnnnd…. no! Still I am excited for seattle peeps though… and the hope of making it up there:). that’ll get your readership back after that horrid baked potato and steamed veggie post! j/k! I am def getting me some mighty o’s for my bday, doesn’t get any better! WHAT?! Better than Ronald’s?! Really??? dude, no way! I seriously cannot WAIT to go here. I tried two flavors (cinnammon sugar & choco coconut) that were offered in the Portland Whole Foods and WOWZA. I would plan a vacation around Mighty O, but mail order wouldn’t kill them! I HATE YOU, SEATTLE! Why do all of these great things have to show up there AFTER I leave?! 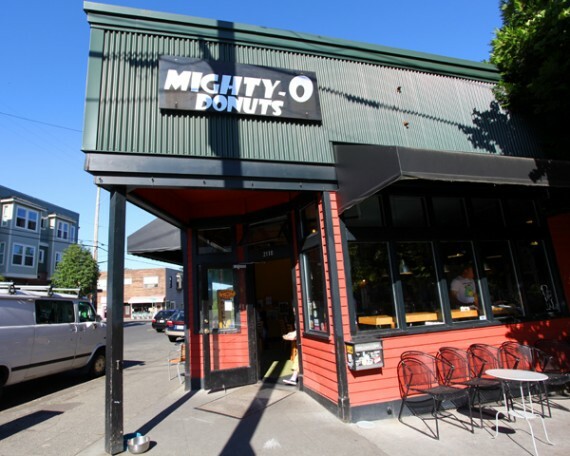 I went to Mighty-O many, many times and they never had any sort of filled donut. Booooo!!! To open this website first thing in the morning (well, actually 10:45am) and see that glorious donut staring at me – you made my day! I still contend that Voodoo in Portland, OR has the best vegan donuts ever (even though they are not an entirely vegan establishment). 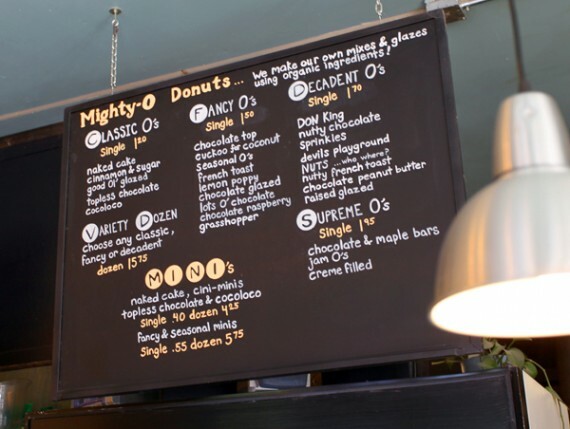 However, Mighty-O donuts are a close 2nd in my book, and certainly the best all-vegan donut place I’ve ever been. I know!! Major injustice/travesty/just totally reprehensible and unacceptable. It makes you want to SUE someone. Get a chance to try Flying Apron vegan bakery in Fremont? Excellent! As good as Babycakes NYCLA is, Flying Apron kicks it’s rear for variety and a little for quality.